Made with only a handful of ingredients and loaded with flavor, this Roasted Vegetable Soup is naturally Dairy Free, Gluten Free and Anti-Inflammatory! 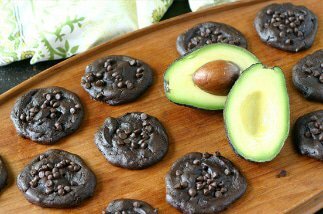 This recipe is created in partnership with Pacific Foods. Fall is here!!! Are you excited? I am. Fall on the East Coast is one of my favorite seasons. There is so much beauty in the trees and most importantly — it’s SOUP SEASON. You all know that I am a just a bit soup obsessed. Seriously, I could eat soup for almost every meal. This Roasted Vegetable Soup with Cabbage is so freaking good. 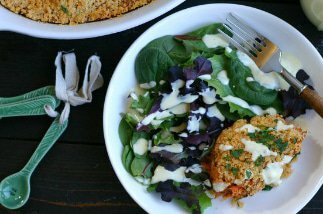 It’s made with just a handful of whole food ingredients and is so warming and hearty. 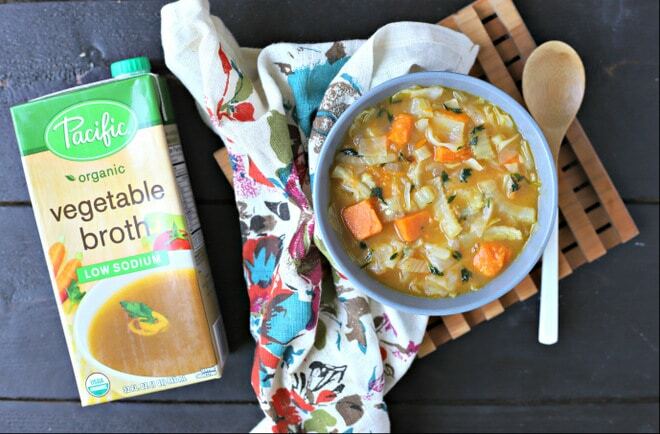 I partnered with Pacific Foods for this recipe and used their Organic Low Sodium Vegetable Broth to balance out the flavor of the roasted and sautéed vegetables. Did I mention that this soup is VEGAN, Gluten Free, Dairy Free, Nut Free and Anti-Inflammatory? You start by roasting some sweet potatoes and fennel and then combining them with sautéed onion and cabbage. Bring it all together with a few spices, a ton of fresh thyme and Pacific Foods Organic Low Sodium Vegetable Broth. You are left with a soup that is simple, loaded with flavor and warming for those cozy Fall days. Made with only a handful of ingredients and loaded with flavor, this Roasted Vegetable Soup is naturally Dairy Free, Gluten Free and Anti-Inflammatory! Preheat oven to 450F. While oven is pre-heating, begin preparing vegetables. 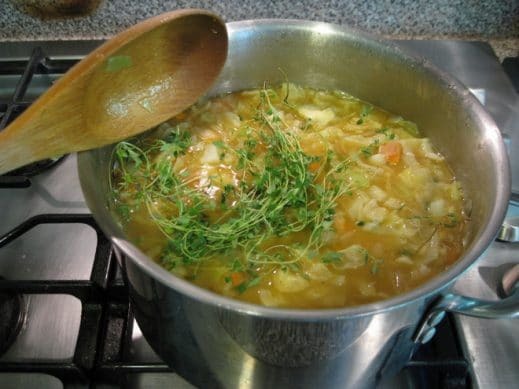 very good soup , I love cabbage so it’s perfect, thank you for sharing your recipe! I hope you love it Marcy!